It was a close call but I finished Baby B's advent calendar on December 1st with enough time for him to get his first token gift from pocket number 1. He was fascinated by it hanging on the door and so far with lots of 'ooooooos' and looks of excitement, I feel like it was definitely worth the effort. Although I decided before last Christmas that I was making this advent calendar it does not surprise me that it was a last min job. It's the only way I know how! 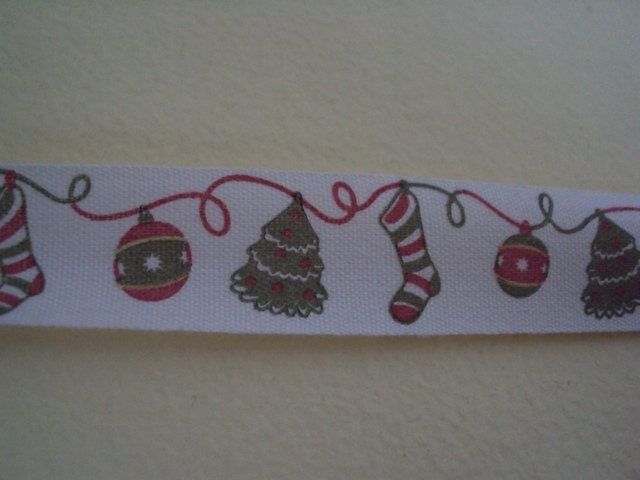 I began collecting Christmasy fabrics last year, including some swatch freebies which I attached to larger pieces of cream fabric, to make the pockets . 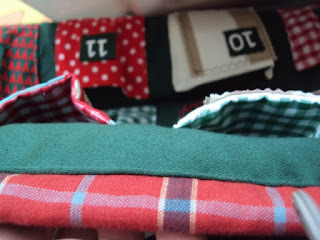 The pockets are random and lined with red and green gingham fabrics. The numbers are hand painted onto small squares of green fabric that also make up the background. Initially, I was going to make this a sack with an advent calendar on the front but as I got close to finishing I realised that it was definitely more likely to last the distance if I didn't allow it to be used in that way every year. I've decided to use the material I intended to line it with, to make a separate simple present sack. It will still fit nicely with this as I used the same material along the top and bottom of this to hold wooden dowels. I have to admit that it was pretty fun to get a bit of woodwork into the project, even it it was a very quick and last minute decision. I cut and sanded the dowels and fed them through the long sections of red material at the top and bottom of the calendar. To back it, I used the same green material as the front with a thick wadding to keep it sturdy. 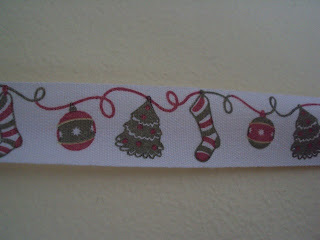 I have used a pretty vintage Christmas ribbon to hang it up. There were a few technical difficulties to contend with but I can safely say, Big J and I are ready to face the world! This project has allowed me to get to grips with my little friend and there are lots more projects to come! I'm certain that this will last for years to come and I can't wait to see Baby B's face everyday as something new comes out of each pocket. Of course I have already decided that any future bambinos will have a crocheted bootie advent calendar. 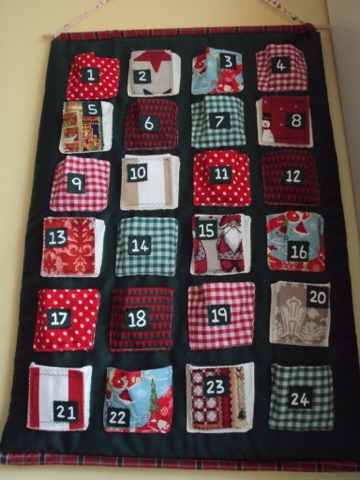 Have you seen any other handmade advent calendars this year that have inspired you? Have you made one? Do you have one that you have made for past Christmas'? Please head on over to my Facebook page to share the pictures with us. You will also see some examples of Christmas crafting from some other lovely people who have shared.